Very soon after the declaration of war in August 1914, not only did men volunteer for the army in large numbers, but those remaining at home organised committees and societies to support the war effort. Some of these ideas were initiated on a national scale, often by prominent women who were able to raise significant publicity, support and funds, and others were more ‘home grown’. Nearly 18,000 charities were founded during the war, many to supply home comforts and books to troops overseas. Women and children filled the vacancies left by absent men, and took on new responsibilities on farms and in factories and hospitals. Voluntary work was a patriotic duty, and people in Shaftesbury and the local area worked hard to involve the whole community in raising funds and providing soldiers’ comforts. However not everyone felt community minded, and when one of the town bakers threatened to ‘deal with’ anyone collecting for the Prince of Wales Fund, the following day the town was plastered with posters making fun of him. As early as August 1914, the Picture Palace, the cinema in the High Street, donated its receipts for one night to supply grants to dependents of men who had joined up; Mr Rupert Williams of Pensbury House installed a practice rifle range on his estate for the Reserves which was regularly used for practice and competitions; and The Prince of Wales National Relief Fund received over £17 (equivalent to £1,360 in 2017) from Sunday collections at St James’ and Holy Trinity churches. In October £138 (£11,000 in 2017) was sent to the fund, collected by the Town Corporation from Shaftesbury residents. 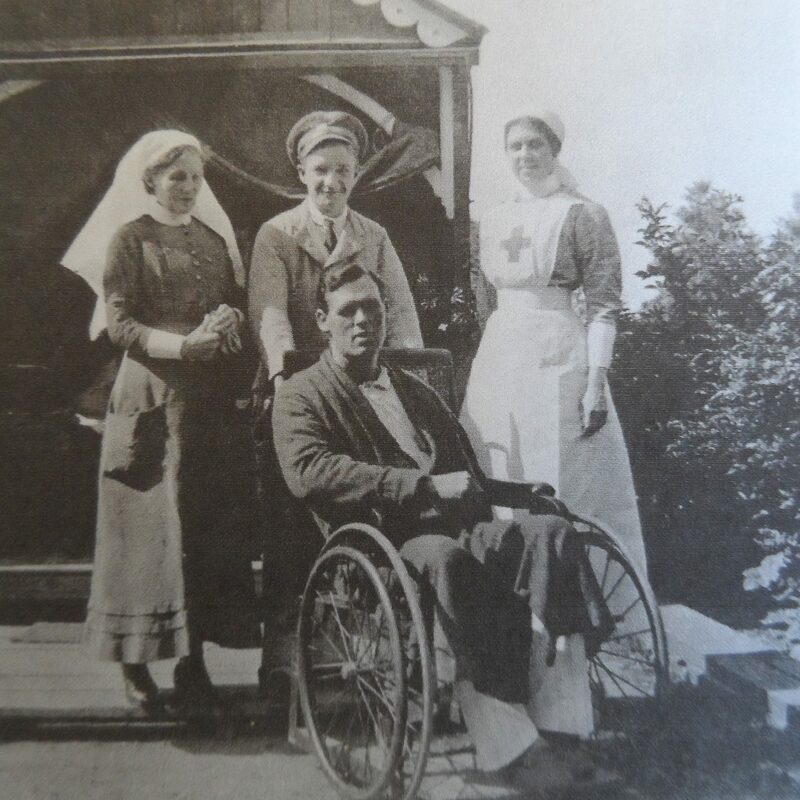 There was an appeal in the Western Gazette on August 14th for support for Red Cross Hospitals, with units already mobilised in Mere, Gillingham and Bourton. The initial patients were men in the camps in the Wylye Valley, but the hospitals would soon be needed for casualties of war. In mid-August The Donheads and District War Workers’ Association was founded, its aim being to provide useful garments for the war effort. By November it had produced 473 articles from nightshirts to bedsocks. They were sent to military hospitals in Britain and France, Belgian refugee camps, a Serbian hospital, to new recruits at Bulford Camp and to the Tisbury Territorials. The war workers’ associations continued producing thousands of items throughout the war, regularly reporting their contributions through newspaper articles. By September the Shaftesbury churches were collecting for the Belgian Relief Fund, and several Belgian families were offered homes in the area, including by the Rutters at Ivy Cross and Lady Stalbridge at Motcombe House. Various efforts were made to entertain the soldiers, and several churches opened their parish rooms for their use. The Corporation set aside a room in the municipal buildings in Bell Street, where periodicals, newspapers, games and writing materials were provided. The Mayoress of Shaftesbury, Mrs Imber, read a letter from the Queen about The Women’s Employment League, which urged everyone to find employment for women who had lost their jobs at the outbreak of war. Later on in the war, women were working in many jobs previously done only by men. 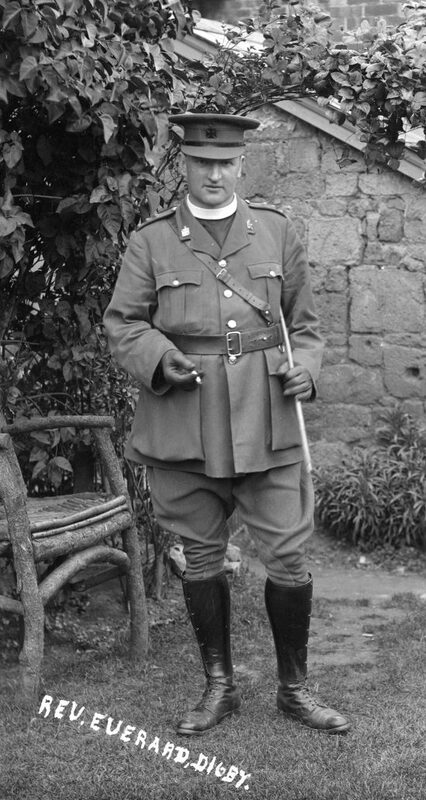 In Gillingham, the “D” Squadron of the Dorset Yeomanry were entertained to a smoking concert in the Market Hall, and also attended a special service at the church, with the local MP, Captain Sir Randolph Baker. 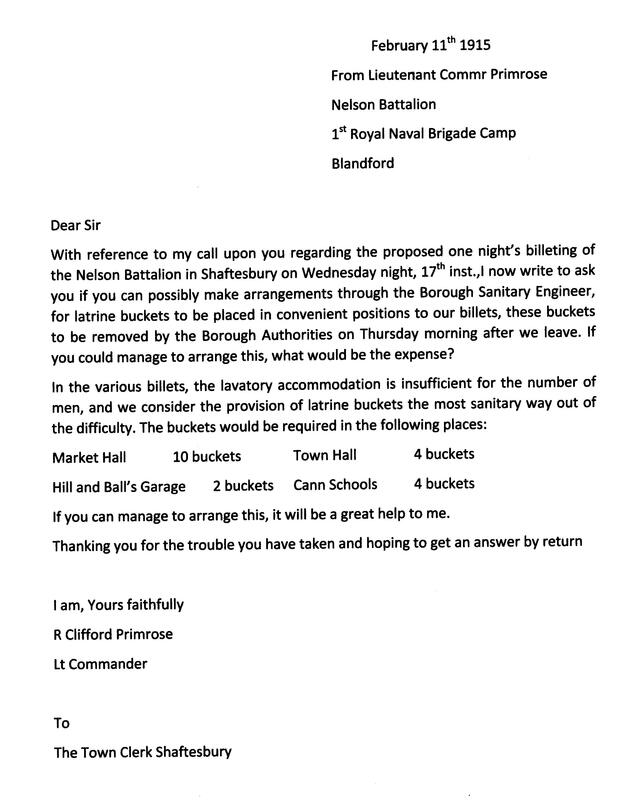 The Red Cross Society was preparing for an influx of wounded men, and schools in Marnhull and Sturminster Newton were accepted as being suitable buildings for new hospitals for 50 men. An appeal went out for single iron beds, sheets, pillows and hot water bottles, as well as for volunteers: women cooks, ward and laundry assistants and men stretcher bearers. In Marnhull a committee was set up to organise Home Defence, including rifle training for every man over the age of 17. 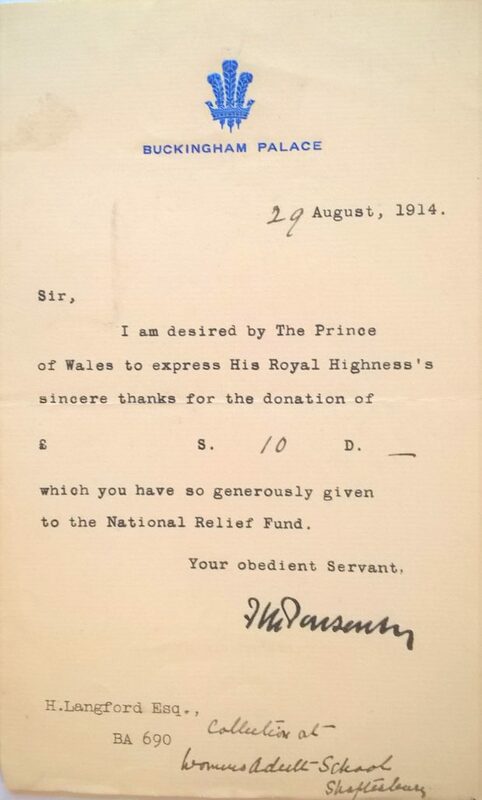 On November 13th a letter in the Western Gazette appealed for generous donations to the British Red Cross. Funds were needed to supplement the 2 shillings (10p, equivalent to £8 in 2017) paid by the government per day per occupied bed. The money was requested for the sick and wounded soldiers in the Wylye Valley, where between 30,000 and 40,000 men were assembled, a significant number of whom in urgent need of medical help. In 1915, fund-raising intensified, supporting soldiers away from home, the Red Cross hospitals, and the Westminster Memorial Hospital. The annual carnival which normally supported the local hospital was suspended during the war, restarting in 1920. The Western Gazette published weekly columns headed ‘Dulce et Decorum Est’, listing the names of those killed or wounded. Many people sent photos to the newspaper offices, and these were used in the Rolls of Honour. The paper was very patriotic and supportive of its readership, publishing national news from home and abroad, and local news of fund-raising to boost morale and encourage even greater effort in very difficult times. In November, Gillingham and Bourton joined forces for an “Our Day” collection for the benefit of wounded soldiers and sailors on the Front, with Red Cross nurses and other women going from house to house appealing for money and selling flags, unfortunately in heavy rain. In 1916 it was clear that there were not enough people working in agriculture, and frequent appeals were made for everyone to ‘do their bit’, especially women, many of whom regarded farm work as demeaning. A War Agricultural Committee was tasked with getting more people working on the land, and it was suggested that women could milk cows, weed fields and allotments, and prepare food and care for livestock. Local trainers taught women how to prepare and store fruit and vegetables and some villages started poultry clubs to increase food supplies. In February 1916, the girls’ high schools in Shaftesbury and Gillingham raised funds for the British Red Cross with sales of homemade food and ‘fancy articles’, flowers and teas, raising nearly £54 (£4,320 in 2017). Miss Dunn, the headmistress of Shaftesbury High School for Girls, worked tirelessly to raise funds for the British Red Cross. There were whist drives, lantern lectures, fetes, teas, rifle matches, concerts and other social activities held every week in Shaftesbury and the villages, virtually all dedicated to raising money for a variety of funds and charities. Bourton Red Cross Hospital reported in April that the hospital was very full, with its two outside shelters in constant use. It was grateful for all donations made so far, including vegetables from Bourton School, and asked for gifts of rhubarb, fruit, vegetables, cakes and groceries, “ … indeed anything and everything is acceptable”. A ‘Pound Day’ was held in May, with nearly every householder donating pound weights (450 grams) of goods, and amounting to 212 pounds (c.100kg) of groceries, jam, sugar, rice, soap and honey, and in addition a sack of potatoes. 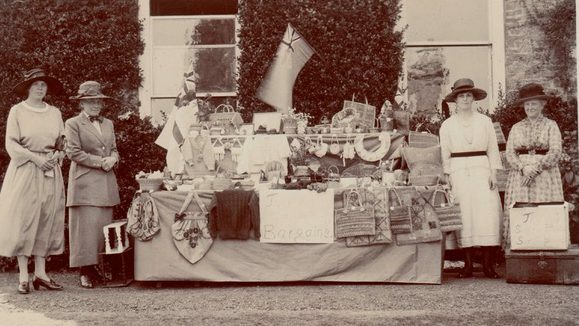 The event was organised by the school, and adults and some of the pupils made a house-to-house collection of the goods. In August a united church service was held in Shaftesbury Abbey’s grounds, preceded by a procession from the Town Hall featuring the police, Holy Trinity choir, the Mayor, Mr Cuff, members of the town council, Boy Scouts and friendly societies. About 2000 people attended the service, and £48 (£3800 in 2017) was collected for the British Red Cross. A harvest festival service was held at Holy Trinity Church, with Boy Scouts, Girl Guides and cadets from Shaftesbury School in attendance, with a string band augmenting the organ, and a sermon by the Reverend Everard Digby, chaplain to the 7th Reserve Battalion of the London Rifle Brigade. Collections were made for the Westminster Memorial Hospital. The Shaftesbury Working Party presided over by Mrs Beaufoy of Coombe House, made over 1,300 garments in 1916/17, sending them to the Dorset regiments in Mesopotamia, the Red Cross Hospital at Southampton Docks and the Serbian Relief Fund. The Post Office collected on average a weekly bag of books and magazines and despatched them to troops free of charge. Nationwide post offices sent over 9 million books and magazines overseas during the war. Vegetables for the Navy were produced on about ¾ of an acre, divided into 15 plots, and worked by 9 volunteers, including Dr Tovey, the headmaster of the grammar school. In 1917, three thousand savoy cabbages were produced, for which the navy was very grateful. The seed had been given free to the plot holders. 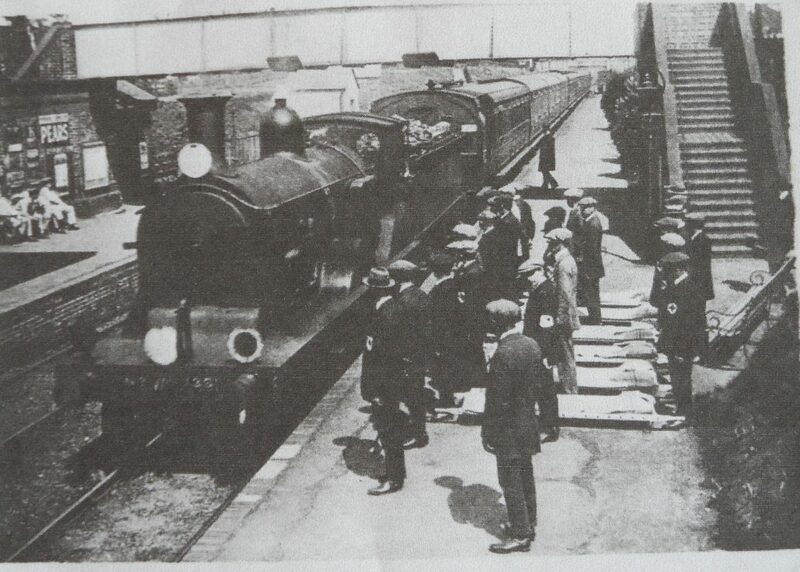 In autumn, schoolchildren were encouraged to collect horse chestnuts, to help with cordite production at Holton Heath. Children from Iwerne Minster School collected over a ton, and the children who collected the most were given War Savings Certificates. Tenants on the Fontmell Magna estate gave generous donations of vegetables to the navy. 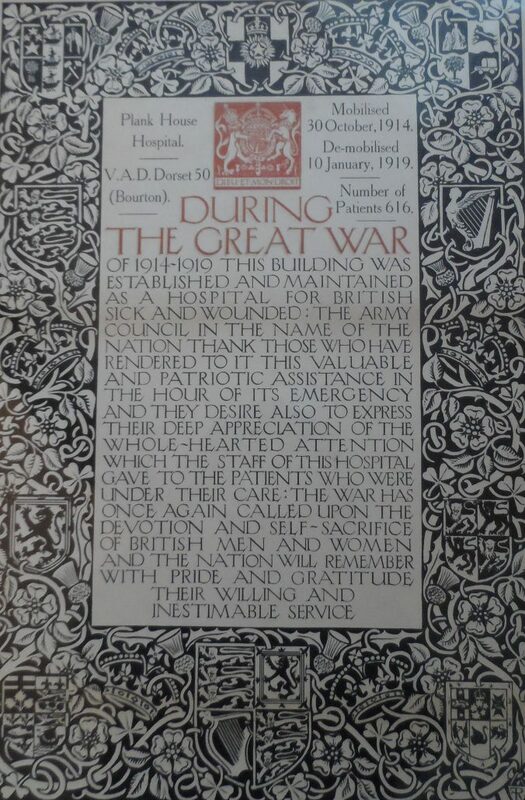 Fundraising efforts did not stop after the cessation of hostilities on November 11th 1918. There were still large number of soldiers serving throughout the war zones and in prisoner-of-war camps, who still needed support. Fontmell residents sent Christmas gifts to every soldier from the village, including prisoners of war. In April a ‘Comrades of the Great War Fund’ fancy dress party and competition was held in the Market Hall, with 400 people attending.